If you have cracked or broken teeth, you may have noticed a large number or functional problems. Or you just do not like the way it looks – either way, it isn’t something you should have to live with. How much does a dental crown cost ? It is a tooth-shaped dental cap that either covers or completely encases a tooth or is the last component of a dental implant. So basically with this technique, you get caps on teeth. 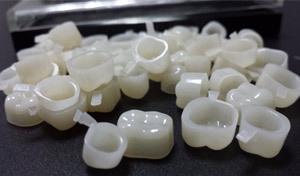 This tooth cap can be made from a few different materials, depending on what your needs are, and are permanently bonded using dental cements. Getting a crown likely replaces your need for tooth extraction, dentures or bridges. Yet, one downside is that dental crowns cannot be used for a complete mouth restoration. There are a few different options when it comes to the materials that will make up your crown. 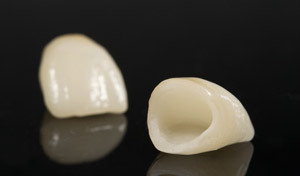 If you only need a temporary solution, this is the type of crown most will go for – especially in pediatric dentistry. If a child loses a teeth before the permanent teeth come in, a stainless steel crown will be used to help position the permanent teeth until the baby tooth falls out naturally. This is the famous silver tooth caps. Metal crowns are the option used for back molars as they are hidden from view. Typically made from a gold or other base-metal alloy or palladium, these crowns last for a long time because they rarely chip. 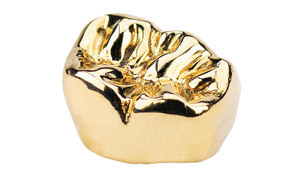 They are thinner, so they don’t require as much tooth reshaping or removal, which can help to keep most of your original teeth safe and the other good thing is it won’t damage the opposing teeth in the long run, when chewing… Gold caps for teeth are pretty popular among famous rappers for the bling bling effect. If you want to color match your teeth and keep up a natural appearance, porcelain fused to metal teeth will likely be your option. Made of a metal shell that has a porcelain exterior, these teeth are more likely to be chipped. They may not look completely natural as the metal can show through near the bottom edge, especially if the gum recedes at all. That is the famous grey line you can see near the bottom of the tooth. Proper oral hygiene is extremely important with this type of crown. Completely ceramic teeth are actually made from any number of natural materials including feldspar and zirconia, those materials allow for color matching. they perfectly mimic the natural translucency of natural teeth. They definitely look like natural teeth. All ceramic crowns or porcelain ones are the most popular choice for aesthetic reasons. So for anyone who wants the best looking option, it is the material to go. Moreover, if you are allergic to metal and can’t choose the others, these are also a very good choice. However, they too are prone to cracking or chipping though new materials are more and more resistant. Your final option are crowns made from composite resin, which is commonly made from acrylic polymers that are mixed with silicon dioxide. They are more affordable than the others, but are more susceptible to fracture and are less durable. You can color match these as well but may look cheap compared to the ceramic type. This is a pretty simple procedure that will require 1 consultation and 2 visits to your dentist. During your first visit, your dentist will look at your tooth and root to see if this teeth capping is an option of restoration for you. He or she will also determine if you need other dental procedures before moving forward – like a root canal to avoid any possible infection. You may also have to get impressions of your bite and x-rays to check your bone density. If you have a severe case, your dentist might refer you first to a periodontist, oral surgeon, or an orthodontist as a prerequesite. Once your dentist decides that you are good candidate to work with, then your dentist will proceed to the second step: the preparation. The next step begins by using some local anesthesia to numb the tooth and then preparing the tooth to support the crown. This step is different for everyone, but include reshaping the tooth throughout filing the enamel or filling in any areas that were damaged. It will depend on your individual situation and the type of crown you will use. Then, your dentist will take an impression and send it away so that a dental laboratory can design and create your custom crown with the best color shade. This impression will also ensure that your crown or cap fits in with the rest of your teeth so that it fits with your bite. It will take about 2-3 weeks to create the crown, so you will be given a temporary acrylic crown until it is ready. Between visits, you need to take care of the temporary crown in order to protect the preparation work performed underneath it. Your definite crown design is strictly based on the size, condition, and shape of the reshaped tooth before you get the temporary crown, so you need to be extra careful not to modify anything. Imagine you break or chip your tooth, then the permanent crown won’t fit your tooth… that means additional work. how to take care of it ? Avoid foods that stick, are chewy, or hard as they can dislodge the temporary crown. When flossing (which you should still be doing), pull out rather than up to dislodge the thread. Finally, avoiding chewing directly on the tooth by switching the side you chew on. Your second visit will likely be your last, although it can take more if you require special services. At your second appointment, your temporary crown will be removed and your permanent crown will be placed and tightly cemented. Your dentist will check to make sure that everything looks and fits like it should. If anything goes wrong, your dentist will have to fix it because any gap or opening may allow bacteria to grow, which can lead to serious problems for you in the long run. There are a few different fees involved in this procedure, and the amounts of those fees will vary depending on your situation. The cost of dental crowns vary greatly, depending on the specific material used. But to give a short answer, a dental crown costs between $120 – $3,000. This is a wide range because the choice of the material will affect the price. Let’s see that in detail. Stainless steel is obviously the cheapest option with a price range of $120 to $350. 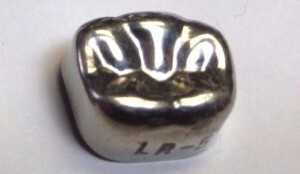 The other cheap option is of course the all resin crown, which costs anywhere between $300-$700. Porcelain fused to metal (PFM) is the option that combines the strength of the metal and the aesthetic side of the ceramic. A PFM crown is about $1,000. The good thing is : if your crown is needed for medical reasons, insurance will cover up to 50% of the procedure, so you can divide the prices given below by 2. But if it is cosmetic, you likely aren’t covered. 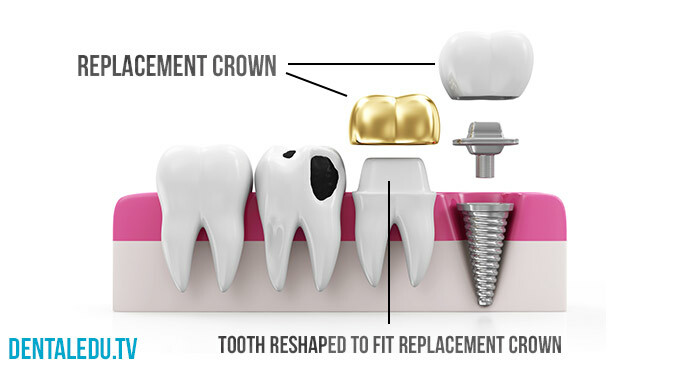 Remember that the price of a crown is to be taken into account for your total cost of a dental implant. After your dental cap is in place, you may have some sensitivity to extreme hot and cold temperatures. That is pretty common. Your dentist will then recommend brushing with a sensitivity toothpaste for at least a while. If you have other pains or discomfort, it is important to tell your dentist right away so that it can be taken care of promptly. Anything painful could be decay, fractures, or gum disease. Proper dental care on a daily basis is the best way to keep your crown in great shape. That means brushing, flossing, and eating healthy foods (meaning no candies, sweets or too many sodas). You can expect your crown to last anywhere between 5-15 years, depending on the material, your lifestyle habits, and your oral hygiene. Your dentist will tell you how to keep everything in tip-top shape. The most important thing is that you regularly have check-ups. While the procedure is safe, there are a few problems that can pop up after having your crown installed. 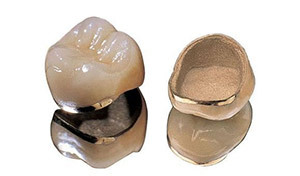 Depending on things like your eating habits and the material used, crown can chip, loosen, or even fall out. Chipping, which happens most often in all-porcelain crowns, can be repaired easily. However, if the break or chip is too important, you will need to get it replaced. Sometimes a crown will have to be re-cemented as the general wear and tear on your tooth can wash it away. Crowns may take a while to get used to, but they are defintely the best way to improve your smile and your bite.